which juts into Lake Champlain from Converse Bay in Charlotte, Vermont. 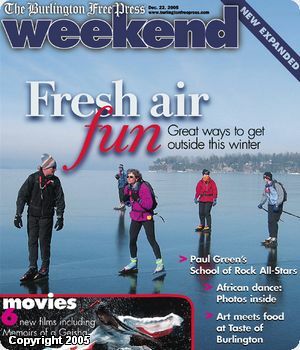 Above right: The Burlington Free Press's Weekend Magazine features Nick van der Kloot's photo of our "Skating to New York" tour from Converse Bay to Split Rock Mountain. Below: Nick's original photo. 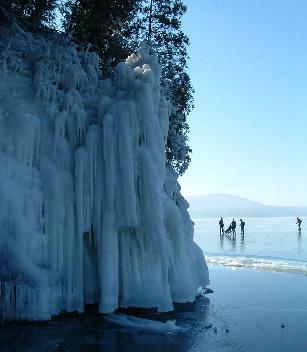 90-mile-long Lake Champlain is called "America's Sixth Great Lake" and its shoreline "New England's west coast." It's truly huge. 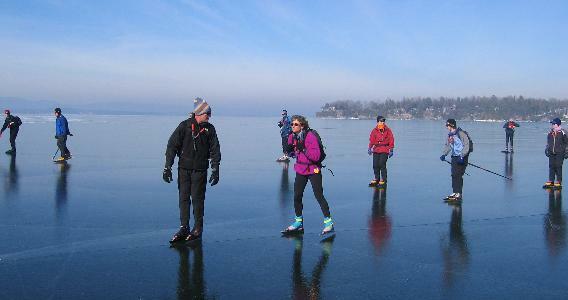 Skating down the very middle of the lake, you see nothing but ice all the way to the horizon. You can look north into Canada or south toward Albany. To the west lie the high peaks of New York's Adirondacks, and to the east are Vermont's Green Mountains including snowcapped Mt. Mansfield. Our tour started near the island village of South Hero, Vermont. Once offshore, we passed the ice-encrusted rock outcrop known as Carlton's Prize (top photo) and somewhat larger Stave Island, then headed for the middle of the lake, passing Colchester Reef and Colchester Shoal (three photos at right). 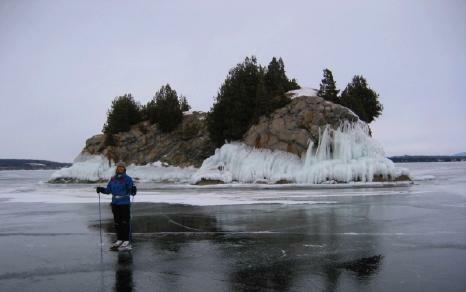 Our route took us past the lakeshore metropolis of Burlington, Vermont, across to the New York shore at Schuyler Island, then southeast to the Four Brothers, four small undeveloped islands just west of Shelburne. Our round-trip distance was just over 30 miles. Visible in the background are the highest mountain in New York, Mount Marcy (5300 feet), and the highest mountain in Vermont, Mount Mansfield (4300 feet).